Champagne Soutiran was established in 1936 when, after a career in the military, Gérard Soutiran returned to his native region to take over the vines of his former tutor and embellished with those acquired through marriage to his wife, Solange. In 1969, he was joined by Alain, the eldest of his four children, and together they traded under the name of Soutiran-Pelletier. Today, it is Alain’s eldest daughter, Valérie and her husband, Patrick Renaux, who manage the families six hectares of vines, centred on the Grand Cru village of Ambonnay. In addition to their own vineyards, they also manage a further four, including the Premier Cru holdings of the Renaux family, located in Trépail, Chigny-les-Roses, Ludes and Chamery. It is this fruit that contributes to the Cuvée Alexandre, named after the couples’ son. 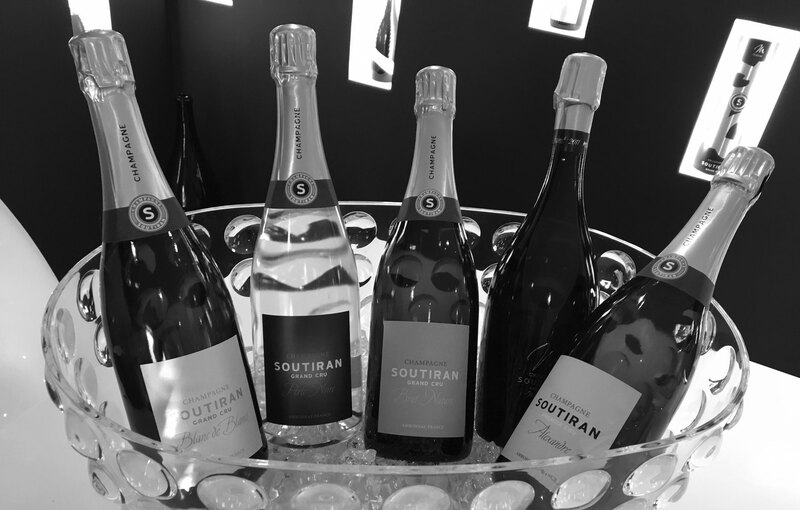 Soutiran’s main point of difference is the amount of age the wines enjoy in bottle before they are disgorged – anything from between five and ten years – with a further six-months minimum on the cork before release. This has a very distinct effect on the style as these are very much gastronomic Champagnes, designed more for the table than as a celebratory drink. Of the four example’s we hold as UK stock, the current assemblage of the Cuvée Signature is base wine from the 2008 vintage. It’s a blend of 60% Pinot Noir with 40% Chardonnay and is 100% Ambonnay fruit. The Blanc de Blancs could be classified as a vintage, since it is solely from the 2006 harvest. One-third of the base wine is aged in barrel and foudre before blending and bottling. The Perle Noire is 100% Pinot Noir and again, sourced from Ambonnay and could also claim to be a vintage Champagne – currently 2010 – and production was just 4,112 bottles. The Rosé de Saignée is 100% Pinot Noir, with grapes from Ambonnay and Bouzy. It too is from a single vintage – currently 2008 – and represents around 5% of the total production. The fruit was macerated on the skins for 3 days prior to the juice being drawn off, resulting in a colour as deep as a light red Burgundy. The result is vinous and something of a curiosity. A Champagne that is perhaps best served with food. As is the current mode, the whole range carries the date of disgorging on the back label, along with precise details on the wines élevage.